Whether it’s a monthly column in the Working Waterfront, or the post of the day on my blog, I tend to write with a little cringe around my eyes and my ego as I imagine someone else reading what I hope will be interesting, funny, or enlightening. I’m not comfortable standing in the middle of recognition, but I really do want it. I want you to see me, but I don’t want you to see me looking for you to see me. Is it possible to have anonymity and still have validation? It was with mixed feelings that I realized this post from a few days ago had been featured on today’s Freshly Pressed page of WordPress. I mean, yesterday I had 123 views of my blog and the day before I had 49. Until today, my all time highest number of views was 136. Just now I checked my stats and I have had 1,840 hits today! It’s mind boggling to me. It was pretty cool to have so many people seeing the bits of the life I am so lucky to experience. Today. What if I can’t come up with something they might like to see tomorrow? I have written 77 monthly columns about island life for the Working Waterfront newspaper. Some months I get more comments about it than others. I have even had a few people tell me it made them cry. (That is a response I will never tire of hearing. The resounding “YES!” that I feel inside when I know I have written something good.) But then what? What if I can’t write a column as good as that one for the next month? I can’t always write a great column, but I’m still here and I still plan to make a monthly attempt. Tomorrow, appropriately, it will be someone else’s blog being featured on Freshly Pressed, and I will still meet my post a day goal. As an artist and a writer I need to keep challenging myself and putting myself “out there,” even when it feels uncomfortable. It’s how I find the anonymous validation I am looking for…also known as self validation. On a totally different subject: Sometimes the tide is high when you come home on the 3:30 mail boat, and sometimes, like today, it is dead low. 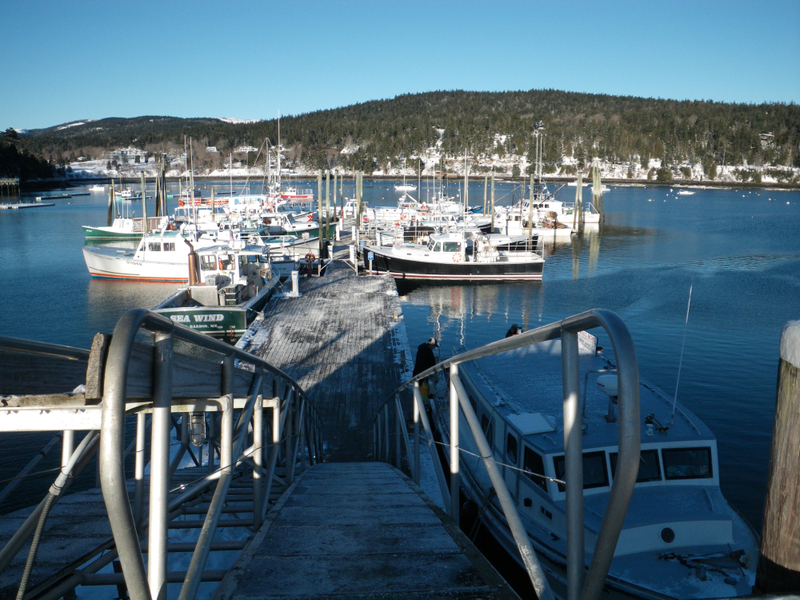 The ramp is steep, and you need both hands to hang on when going down to get on the boat. Not the time to try to carry several bags of groceries, all at once, on the way down. Just to the left of the ramp is a freight ramp. Can you imagine how fast my 40 lb. bag of birdseed slid down this icy sucker? It landed halfway across the float, beyond the stern of the mailboat. Whee! There are are going to be some happy birds on the island! What kind of birds do you see in the winter? It always amazes me such small creatures can live through a winter. Louis, we see mostly chickadees and nuthatches. One white-breasted nuthatch comes around, lots of juncoes, a few woodpeckers, and some redpolls are just starting to show up. They don’t come every winter, though. um, barb? that is just ridiculously cool. interesting timing, too, considering the doldrums! i would be paralyzed with discomfort if i knew a thousand-or-so people looked at my blog. this recognition is SO well-deserved! have fun in baltimore-beat the storm out (it’s already nailing us-ANOTHER snowday. what can ya do, eh?)…. I know. It’s almost spooky. Thank YOU so much for recognizing the discomfort level. Weird. Gratitude and discomfort occupying the same space! And I have you to thank. You were the first person I actually knew who “blogged.” If it was something you did, it was something I was interested in. Another snow day. This is getting crazy! We changed our flight from Wed. p.m. to Wed. a.m. The today changed it to Thursday p.m. Stay tuned…..
thursday pm sounds better to me! sounds like i’m kissing up to you cuz i want something (hee, hee) but i really do mean it! 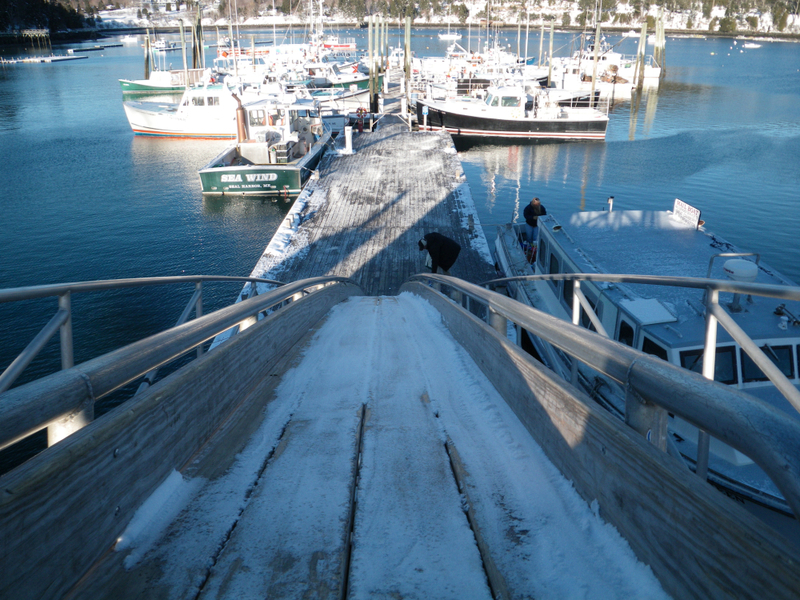 Eileen told me last night how steep and ugly the ramp was yesterday. I loved seeing the pictures and reading your description. Glad you changed to Thursday..planes might even be flying by then again! I felt that too when we wrote the column together. It’s never easy to “put yourself out there.” I’m glad you do! Glad we stayed home today. I got some things added to Etsy. What a winter eh? That would be blog recognition I believe!